Styling Magazine by Coty Farquhar - Australia: I'm hosting a (pretend) dinner party tonight for the Fashion Editors from the Sixties!! I'm hosting a (pretend) dinner party tonight for the Fashion Editors from the Sixties!! most amazing dinner party that I could possibly ever host. It's set in the Sixties, when glamour and parties where truly a fashionable and stylish celebration. people from the magazine world of the 1950's and 1960's. I know!! can you just imagine!! and I was surrounded every day by creative and inspiring people. many of which I still have. Some are well known, some you may have never heard of, they are the people behind the great covers and beautiful advertising that we all know and love. They are the people that styled and created the most beautiful settings using, what I believe, the most simple and clever props and backdrops ever. They have been copied time after time, they're work is used constantly for reference by the young magazine editors and designers of today........... it's unbelievably beautiful! I can't get enough of it either, I love looking at these old covers, the ads and the editorials inside. It was a graceful and elegant time and I would have loved to have been a part of it. 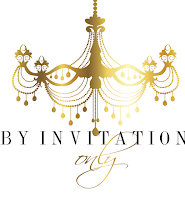 for the monthly blog party "By Invitation Only" at Splenderosa blog. My Special Guests........... all women and just one man! to place a black woman on the cover of the magazine. 7. Rene Gruau - Artist extraordinaire - Oh how I would have loved to have worked with Rene! Sheila's name was ingrained into me as a young girl at Vogue. I loved Seventeen Magazine and all the colourful editorials! you can imagine on my face and in my heart. and I have added the magnificent images from the sixties magazines. The location of my party doesn't really matter, it's the conversation throughout the night that interests me. and Nat King Cole music will fill the air. their next fashion stories. Models will be discussed and who's who in photography. This is a table full of very talented and creative people. Everything will be inspected, touched and talked about, so, I will bring out all the goodies, that's pretty normal for editors, they are doing their research for the magazine, and dinner parties are the best place to find out what's new! Where did you get this Coty??? Who made this? Who is the artist? What is the fabric, Who is the designer? would you like to be with us at this party? Simply fabulous, Coty...and yes I would love to be with you at this dinner party. Every image is just stunning...you've left me speechless...inspired post. Brilliant, brilliant, brilliant! Gorgeous, gorgeous, gorgeous! I once interviewed Diana Vreeland, she was divine, absolutely divine. Can only imagine what a wonderfully glamorous event this might be. Enjoy..sounds like a fabulous way to be surrounded by so many greats! I'm sending everyone over to you immediately. You have won the prize for most creative, Coty. I didn't intend to award prizes, but I had to give Tish the prize for venue, and now you've won the prize for most creatively beautiful post ever done. So beautiful. I'd love to be wearing the gorgeous pumpkin colored formal gown and be a guest...such an interesting group! I think the editor of Seventeen was Enid Haupt. I read that magazine religiously when I was a teen in the sixties. It was my fashion bible and I never missed an issue. Fun post....nice going down memory lane. So many beautiful magazines and gorgeous outfits. Absolutely glorious. Those grapes will stay with me. Such images! Fabulous darling, just fabulous. I'm sure many of your colleagues will adore reading this post. They might be calling shortly to urge you to throw a real dinner party soon! In your spare time...I know. A beautiful post full of glamour and incredible memories for you I'm sure. My mother might be under the impression that you extended a real invitation to her. Don't be surprised if she arrives! Phew!!! I am establishing squatting rights here on your post and I do not know how you are ever going to evict me!! This is fantabulous! I am most pleased to see that you also have mags dating back to the years dot, just like me! I did know some of your guest but not all, though, I am sure they are all intriqueing... I am new to the group and next time I will most certainly invite you if you bring your old mags with, please?? Once again you bequile us all. On the day of posting I was not able to comment due to blogger problems and was sooooo upset! At least I could post my Dinner party gueat list, so I just had to come back and leave a comment. I would love to establish squatting rights at your table and on this post please. It is a feast for all mine seanses and I am totally enchanted!! I am also most please to meet someone who also have magazines dating back to the year dot! What a wonderful post!